Like all equipment, when choosing a sealcoating machine, uptime, speed, efficiency and durable, high-quality results are on the line. To be successful the unit must deliver on all fronts. But not every sealcoat machine is right for every contractor. Follow these guidelines for optimal productivity and profits. The first thing to consider is the type of mix being used. What might deliver fast, high-quality results with one type of sealcoating machine pump could drain efficiency and profits with another. It’s important to know your mix and what kind of pump can handle it. Most mixes have between 5 and 6 pounds of sand per gallon, which can be used with Bowie, or gear pumps. These pumps feature a gear that spins inside of a cylinder. The gear creates suction that pulls liquid into the intake side of the pump, and then pushes it out the discharge side. While these pumps have been around for more than a century, keep in mind they tend to lose suction over time, so they are not ideal for modern sealcoating applications. There also are certain things to keep in mind with lower sand mixes. Diaphragm pumps, which pull liquid in as the diaphragm contracts and then pushes it out as it expands, can be used to pump mixes with as little as 2 pounds of sand per gallon. 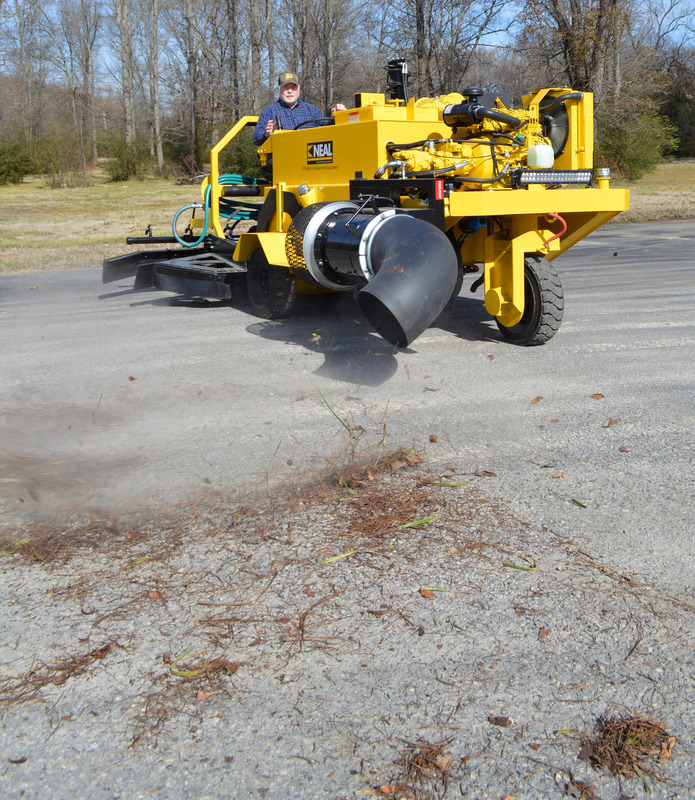 This can be an advantage with smaller jobs, such as driveways or anywhere without heavy traffic, but if larger commercial jobs are on the line, a sealcoating machine with a more powerful hydraulic pump is in order. Hydraulic-powered piston pumps can take on mixes with 8 or more pounds of sand per gallon—mixes that give contractors the ability to take on a wide range of projects, such as federal jobs and larger commercial projects. The pump uses hydraulic power and pistons to continuously pull liquid in and push it out, which also makes them ideal for thicker materials, such as asphalt emulsions and modified sealers. Hydraulic-powered piston pumps also allow contractors to move materials 40 percent faster than diaphragm pumps, so larger jobs get done quicker. Matching the pump to the mix for success on the surface is one thing, but considering what goes on behind the scenes is another. Bowie pumps must be greased often, and abrasive high-sand mixes and asphalt emulsions can quickly wear down the rotary gear. This causes a gap in the seal resulting in pump pressure loss. Rebuilding it can get expensive, considering material costs, labor and downtime. Diaphragm pumps also require regular maintenance. They use rubber seals, which must be replaced regularly. Leather seals, like those found in piston pumps, don’t need daily upkeep and have been known to last through as much as 200,000 gallons of sealcoat before replacement is required. Just as understanding pump systems affects your bottom line, so does finding a machine with a tank suited to fit the operation. 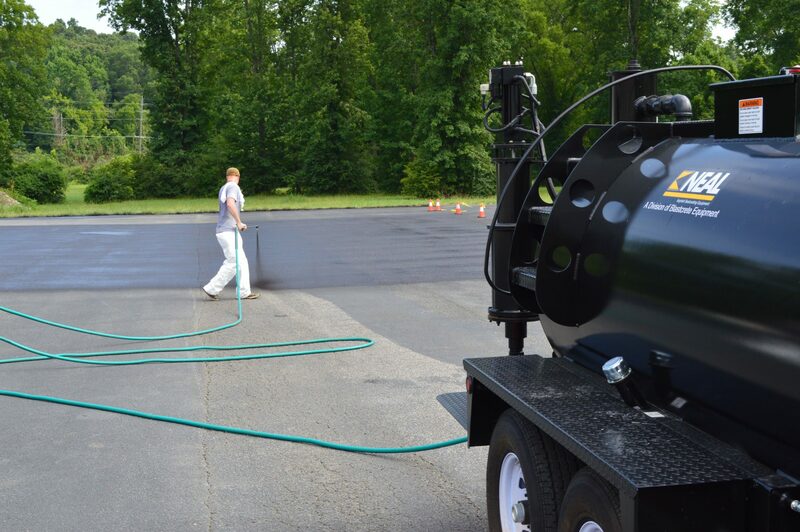 When working on smaller jobs, such as residential driveways or small parking lots, a 750-gallon tank is big enough to complete each project without refilling. Larger jobs, such as airport runways and mall parking lots, on the other hand, will likely require a larger tank to minimize refills. Some tanks, such as skid-mounted units, can hold as much as a few thousand gallons. Ensure the truck or trailer used to haul the unit has ample axle capacity to support the system’s weight. Keep in mind this includes the weight of the equipment plus the material that will be inside of it. Sealcoat generally weighs around 10 pounds per gallon, sometimes more depending on the amount of sand in the mix. That means a 750-gallon tank that weighs about 4,000 pounds empty will have another 7,500 pounds of pressure on the trailer axle when filled. When it comes to sealcoating jobs, productivity and profits are on the line every day. Use a machine that matches the operation then uptime, speed, efficiency and durable, high-quality results will win every time. For more information, contact (770) 830-1282 or scott@blastcrete.com. Maury Bagwell is the lead engineer at Neal Division of Blastcrete Equipment Company.